Our 2007 Hyundai Sonata has the stock radio with XM support, but no line in jack. We never use the XM, and had been using an iTrip to stream our iTunes through the radio. Radio tuners like the iTrip are annoying, though; if you drive far enough, you'll have to tune to a new station, which is both inconvenient and dangerous while driving. I considered replacing the head unit, but that requires buying a head unit and adaptor, and it would like kind of ugly. 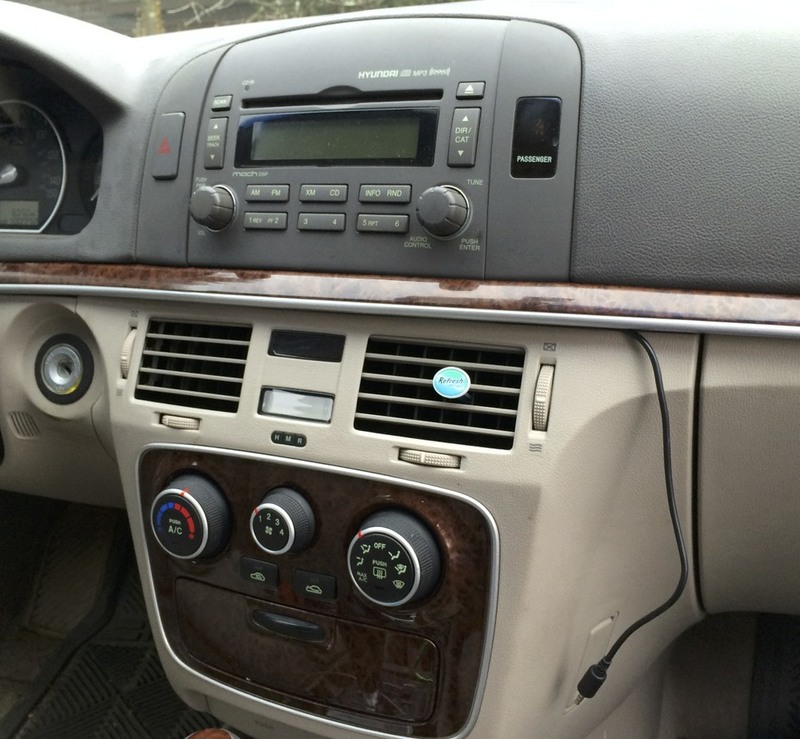 I also looked into using a 2009 Sonata head unit, but unfortunately the mounting and general style changed too much to install one in a 2007 model. I did some googling and found out that a few people had done line-in mods on the Sonata's stock radio. One mod involved modifying the radio itself so that an FM modulator could be installed. That was a bit more involved than I was comfortable with, and FM modulators aren't ideal, as you need an external switch to toggle it on and off. It does allow you to keep XM support, though. I found another mod that simply required modifying the XM harness that plugs into the back of the head unit. While the article was 2008 Sonata, my 2007 was identical. The mod is very simple; the XM harness just carries left, right and ground signals. You do have to cut the wires to the original wiring harness so that you can reuse the connector, though. The actual process was straightforward, with the hardest parts being getting the stereo out in the first place, and even that wasn't overly difficult. I simply followed the instructions, unscrewing the trim trop from the glove box and popping out, then removing the screws holding the two pieces on either side of the radio before unbolting the radio itself and sliding it out of the dashboard. Again following the instructions, I unplugged the XM harness from the back of the radio and cut the wires. I took an old 1/8" stereo headphone extension cord and soldered its left, right and ground wires to the stereo's left, right and green ground wires (black would have worked too, but apparently not both). I wrapped the wires in electrical tape to keep them from shorting against each other. In my case, the extension had separate insulated wires that were easy to strip, but I've also come across headphone cables with apparently no insulation at all. Instead, the wires are covered with a lacquer or enamel that acts as insulation. Some googling came up with a few ways to solder to these: sanding or scraping with a knife, for example, or heating with a lighter, can remove the lacquer. But some of these are actually designed to melt away when heated with solder. That was the case with one I tried when I needed a female to female audio coupler cable -- I simply soldered the two coated wires together. Back in the car, I wrapped the cable around part of the dashboard structure to act as a strain relief, so that pulling on the cord wouldn't damage the new connections. I snaked the cable out under the trim strip below the front of the radio; it dangles in down near the glove box, and can be tucked next to the glove box if we want to keep things neat. I couldn't find a good way to run the cable through the dash and down to the footwell due to all obstructions in the way of the cable's path. The remaining cable is short, so I plugged an extension into it so that the phone isn't dangling six inches under the radio. I also managed to lose two of the clips holding pieces on either side of the radio on; they're a little lose, but they stay pretty much where they should. One of the plastic posts broke when I removed the trim from the the end of the trim strip, but none of these are real issues and don't affect the look of the car in any way. And now I have a line in jack. This seemed to work pretty well in my initial tests, but after a bit of driving around it became clear that something was off with the audio. For some reason, vocals seemed to come out of the right speakers, and music out of the left. I can't fathom why that would be -- I'd have expected stereo separation, not this odd processing of the music itself. Another issue is that charging my phone would cause the audio to quit on the right speakers. This also made no sense at all. Neither of these problems are not with my phone, as best I can tell -- headphones work perfectly, as does an Bluetooth A2DP headset I use on hikes, and I've never had problems playing music when plugged into power before. I tried to resolve some of these problems with a Kivino BTC450 car Bluetooth receiver. This is a pretty decent module, featuring A2DP and hands-free calling via a button/mic combo that sticks to the dash. It can trigger Siri, answer calls, play/pause music and go to the next/previous track. After some initial issues with pairing and building a 1/8" female to female audio coupler cable, I found that I had the same troubles when I plugged it into the stereo -- nothing out of the right speakers, and only some sound out of the left. The behavior was the same as when the phone was being charged by the car, which makes sense; both devices were using a common ground. I tried switching which from the green wire to the black wire on the harness, but this had the same problem with the left speaker and a loss of sound from the right speaker when charging the phone. I also tested the wiring with a pair of headphones, plugging my phone into headphone plug I'd wired to the harness, and attaching wires from the harness connector to a the plug on a pair of headphones. Both left and right channels sounded perfectly fine. I also tried running wires from the connector to the pins on the head unit itself. This allowed me to swap the left and right channels while in the car, thus proving that my wiring itself was sound. No matter what, the left speakers still sounded washed out and didn't seem to carry the vocals, and the right speaker cut out entirely when the phone was charging. I have no idea why the car radio refuses to handle the left speaker properly, or why the right speaker cuts out while charging the phone. All in all this was something of a failed experiment. It seems my only solution is to replace the head unit with an aftermarket one, but my wife isn't keen on that idea, so we'll probably just have to live with it as is.